Road bikes mean different things to different people. For some, they’re the ideal commuting method, for others, they’re a way to get out and explore their surroundings, for others still, they’re something to race on. If you’re looking to purchase a road bike you might easily be overwhelmed by the level of choice that’s available to you. There are plenty of different features available. What you’ll generally be looking at, though, is a bike that is generally built for speed. A road bike is exactly what it sounds like: a bike designed to be ridden on roads. So, you should expect fairly slim road bike tires, minimal (if any) suspension, and possibly a racing geometry with dropped handlebars. In this article, we’ve chosen ten possibilities for a beginner road bike. In each case, we’ve explained what the bike is like and why it might be a good choice for you. To do this, we’ve highlighted some of each bike’s best features. Remember – safety first! Get a road bike helmet here. This bike has more of a hybrid feel to it than a pure road bike. That might not, however, make it a bad thing. Hybrid bikes can offer a really great solution for urban environments. 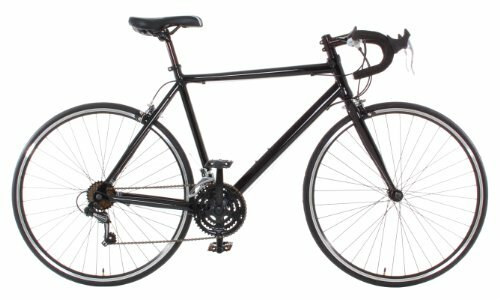 So, if you’re looking for a commuting bike and you’re wanting to get around a city, this might be a great option. 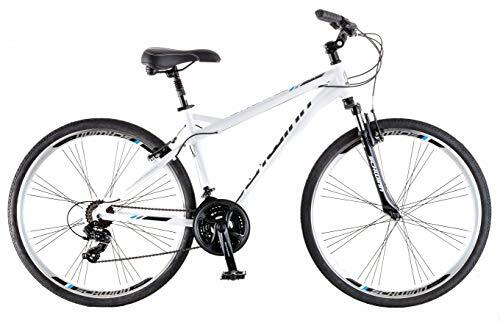 It has an aluminum alloy frame which means the bike is lightweight but sturdy. A lightweight frame is really what you’re looking for in a road bike because it means you can achieve those high speeds. The Schwinn Network 3.0 has a suspension fork, which makes it much more of a hybrid bike. This means it adds a fair bit of weight, but it’ll absorb the shocks and vibrations from a badly paved road. It also offers suspension in the seat post, offering even more comfort. It has 700c wheels and will fit adults from 5’4” to 6’0”. Why We Like It – If you’re looking for a bike that is well suited to urban environments with strong road bike credentials, the Schwinn Network 3.0 offers you a really good solution. You’ll get a comfortable ride without having to over-compromise on speed. This bike looks much more like a traditional road bike. It has an eye-catching design and has some genuinely exciting features. It is built around a steel alloy frame, which is heavier than aluminum but offers a sturdy alternative. The bike has aerodynamic tubing which minimizes wind resistance when achieving those top speeds. In conjunction with this is the racing geometry and dropped handlebars. They encourage you to ride in a way that maximizes leg power and reduces drag. At the front and rear, it has disc brakes which offer superior stopping power to conventional V- or caliper brakes. Disc brakes are especially useful if you’re planning on riding in adverse weather conditions. At this price point under $500, disc brakes are a surprising feature. Also available on this bike are wheels with three aero-spoke wheels. They look great while minimizing air resistance. Single speed bikes recently saw a huge spike in popularity. They’re definitely a fashion statement in a lot of urban centers. Unsurprisingly, this ‘fixie’ (fixed speed) has a paint job to match its cool image. Single speed bikes aren’t just about looks though, they’re a good option as an urban bike. They’re straightforward and easy to repair and will see you achieving impressive speeds. This model has a steel frame and drops handlebars. It’ll encourage a racing position and reduce wind resistance when you’re cycling at speed. It is a little on the heavy side at 29.5 pounds, but it’s still a great bike. It features alloy side pull breaks front and back which will give you strong conventional stopping power. There are an alloy hub and alloy rims too. 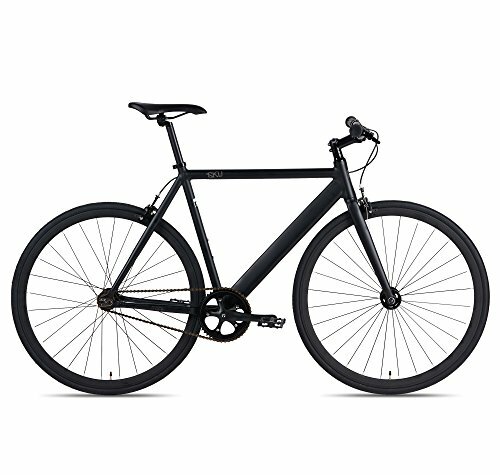 A great value bike offering you an exciting fixed speed option. Why We Like It – If you like the sound of a single speed bike, this is going to be a real contender. It’s a great value, and the core components that are offered are of high quality. Plenty of opportunity for upgrading and personalizing. This is another, slightly more expensive single speed, bike. This bike has a ‘track frame’ that is built for speed. It’s made from 6061 aluminum which is lightweight and offers a bike that can achieve some serious speed. It has a Flip Flop Hub in the back wheel which means that it can be ridden either fixed gear or freewheel. A truly fixed gear bike means that your legs have to keep moving with the wheels. A freewheel bike is how most bikes are designed, they feature a ratchet mechanism which allows you to stop pedaling while the wheels are still turning. The Flip Flop Hub means that you just have to take the wheel off and put it on the other way round to change your riding method. An advantage of fixed wheel cycling is that you can break by just pedaling slower. In response to this, the 6KU offers front and back brakes that are easily removable if you’re a ‘fixie’ purist. Why We Like It – A seriously cool fixed speed bike. It’s perfect for zipping around an urban environment or even a racetrack. The Flip Flop Hub can let you experiment with fixed gear riding. A gravel bike is a very specific kind of road bike in that it is designed to be ridden partially off-road. It has the same kind of geometry, but it basically has thicker tires, allowing it to ride on gravel tracks. They also make great commuter bikes because they can easily tackle the potholes and curbs that urban environments will throw at them. 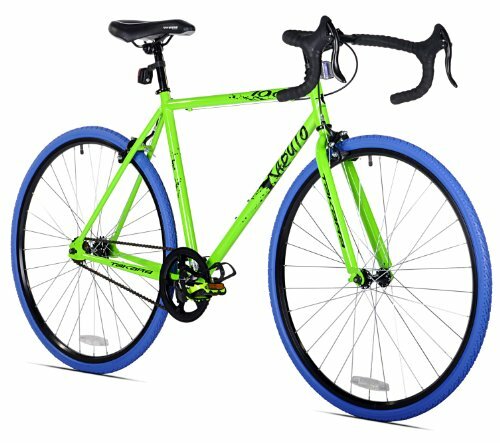 This gravel bike has a lightweight aluminum frame which will mean a great combination of durability and weight. There are flat handlebars which offer a more comfortable, upright riding position. There’s a high-quality Shimano Acera 9 speed drivetrain which will offer ample gearing for tackling most hills. Additionally, another great feature of gravel bikes is that they’re usually fitted with disc brakes. These offer you superior stopping power, especially in wet conditions. Another advantage for commuters. Why We Like It – A great gravel bike that has been built using some high-quality components. The aluminum frame will give you a lightweight bike that can get some great speeds. Some off-road capability makes for a versatile bike. This is a classically designed road bike. It has a chromoly steel frame which combines extreme strength with a surprisingly low weight. Chromoly is quite a bit sturdier than aluminum and quite a lot lighter than regular high tensile steel. This means that the bike should last you a very long time and would be very well suited for touring. It has a 16-speed Shimano Claris gear system which will offer you plenty of gearing range to tackle a wide range of terrains and profiles. You’ll have great pedaling efficiency and be able to achieve genuinely impressive speeds. The front and rear alloy caliper brakes will offer you responsive braking with good stopping power. The handlebars are dropped, encouraging a racing posture that will reduce wind resistance. It features Hutchinson Nitro II tires with all-weather treads that offer an excellent level of safety and control, even in wet-weather conditions. Why We Like It – A classic road bike with some impressive components and features. Would be suitable for race training. A Schwinn road bike with a women’s design. 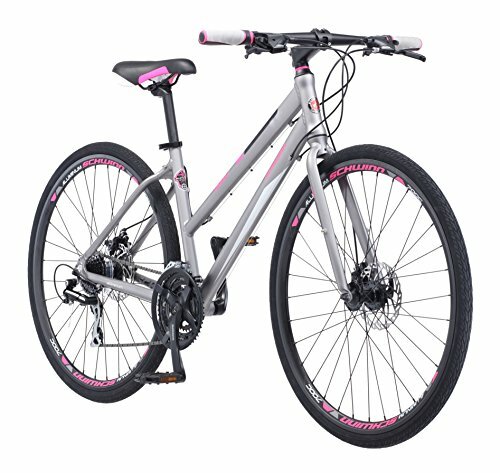 Women’s bikes tend to be a little smaller and have narrower handlebars and different road bike saddles for longer rides. This Schwinn bike has an aluminum frame with a carbon fiber fork. This results in a lightweight bike that handles very responsively. Carbon fiber is a very high-end material that is lightweight and usually very strong. It’s fairly common to have a carbon-fiber fork as it reduces the overall weight while giving extra strength where it’s needed most. This bike has a 16-speed drivetrain that offers great versatility for climbing. The Promax alloy caliper brakes offer precise stopping without adding too much weight. The wheels feature high profile alloy rims with paired spokes, meaning they’ll be nice and durable. It’s a bike that’ll happily take you around town or on adventures down country roads. Why We Like It – A great classic road bike with a women’s frame. The carbon fiber fork is a surprising feature on a bike of this price and makes for a nippy ride. This is a great value bike for what it is. It’s a classically designed men’s road bike with racing geometry and dropped bend-over handlebars. The aluminum frame is made from 6061 alloys and is a genuinely very impressive feature on a bike of this price. It’s been drilled so that you can easily install a water cage if you’re wanting to go on long rides. There’s a 21-speed Shimano gear system that’ll help you handle steep terrain. For shifting, there are simple but effective Shimano A050 thumb shifters. The wheels are 700c and double walled. They’re of a high standard and will give you good rolling capacity. The bike is very lightweight and will get you around quickly. For the price, this is a great bike. Why We Like It – For the money, this is a great bike. An aluminum frames mean that you’re looking at a very lightweight which means you’ll be able to achieve those top speeds. The drop bars will reduce your air resistance. The Raleigh Merit 2 is an endurance road bike. It’s built to combine comfort with speed. Its geometry is race-orientated but isn’t too aggressive. It has a full aluminum frame and fork offering a nippy and responsive ride. The aluminum means that you’re looking at a lightweight bike that has a good level of acceleration. The crank is made from aluminum too, shaving off a few of those ounces. The Merit 2 has disc brakes at the front and rear. This allows for slightly wider tires which will give you a bit more stability on rougher roads and will help when you’re tired after a long ride. The disc brakes also offer superior stopping power. There is a 16-speed Shimano gear-system with Claris shifters. The Clari’s model will give you smooth gear shifting confidently. The frame has built-in rack and fender mounts, so it has the potential to be converted into a speedy commuting bike. Why We Like It – A really strong offering from Raleigh. It has some great components and a good central frame and fork. If you need something that can take you the distance at speed, this would be a really great choice. 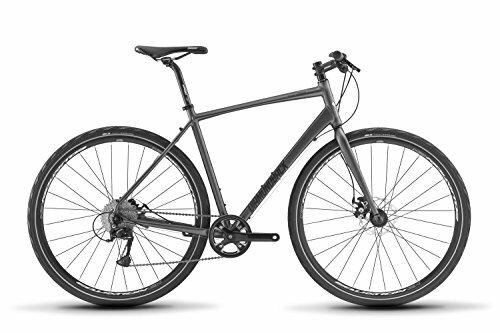 This is an upright geometry, and flat bars make it look closer to a fitness or hybrid bike. However, the aluminum frame means you’ll be able to compete at a speed level. 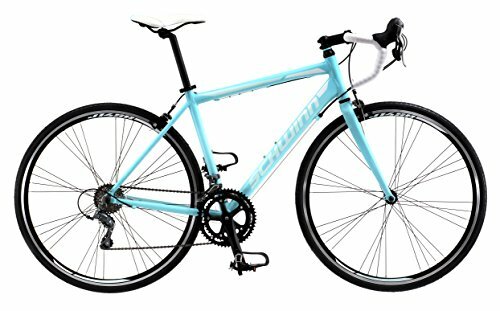 It comes in either a 17″ (with a women’s bike geometry) or 19″ (with men’s bike geometry), so you should be able to choose a bike that fits you well. In both models, the geometry encourages an upright seating position which is more comfortable. It has moderate width tires which give the versatility of being able to achieve reasonable speeds without compromising on stability. There are mechanical disc brakes at the front and rear, offering great stopping capacity. The wheels themselves have high profile double wall alloy rims and will offer a sturdy but speedy ride. Why We Like It – A great versatile bike that would suit someone who was looking for something to get them out and about. It’s a responsive ride that’s great fun to ride without compromising on comfort. When you’re thinking about what beginner road bike to purchase, you want to think about exactly how and where you want to ride it. Are you a speed freak? Or do you want something more sensible for commuting? Maybe you’re just looking for a bike that can get you out to do a bit of exercise. Whatever you’re looking for in your bike, it’s about weighing up your options (including budget) and making the choice that’s right for you. Different materials, designs, and components can hugely affect the price and performance of a bike. In this section, we talk you through what to look for in a road bike and explain what sorts of features result in what sort of bike. The material that your bike is constructed from is going to hugely affect its performance. With road bikes, you tend to want to have the lightest weight bike that you can have. This being said, you still need to have a strong material so that your bike is durable. There are a few different kinds of material that you can choose from. Most of the weight is taken up in the frame itself, but occasionally the forks are made from something separate. Steel is a very common material in bikes. High-tensile steel is the cheapest bike material. It is strong and very durable. It isn’t the lightest material, and you might end up with a fairly weighty bike. Chromoly steel is much lighter but just as strong. It’s a bit more expensive but is extremely durable and a good option for touring bikes. 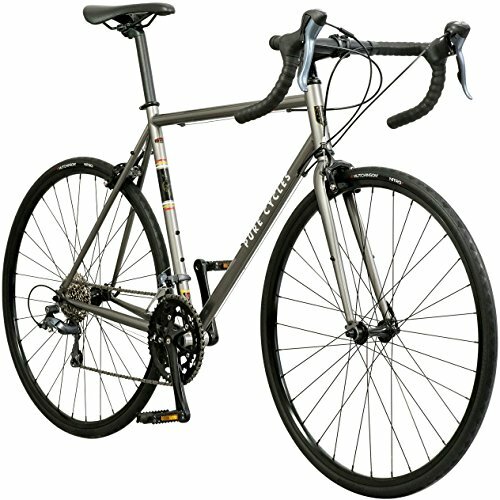 Aluminum is commonly found on road bikes and is a good option. It’s lightweight and strong. It’s a bit more expensive than high-ten steel, but you’ll notice the difference when you need it. Carbon fiber is very lightweight and can be made very strong. It’s the most expensive of the materials and usually found on the highest-end bikes. Typical racing geometry encourages the rider’s back to be horizontal. This is because it severely reduces air resistance, particularly when you’re traveling at speed. This geometry is usually encouraged by drop handlebars, which allow you to grip the front of the bike at a lower point. If speed is your concern, this is the geometry you should be looking at. A more upright geometry is generally thought of as more comfortable, though. It’ll usually have flat handlebars and encourage a vertical sitting position. If you do build up speed, you’ll notice a lot of drag against your chest. It is, of course, possible to get a geometry somewhere in between the two which combines speed and comfort. Gears are useful because they allow you to get tackle climbs more easily. Any gearing gives you much better climbing potential. Often, in fact, more gears don’t necessarily give you a better bike. An 8-speed should give you ample capacity to get up all but the toughest of climbs. Fewer gears also mean less to get wrong. A single-speed bike (without any gears) might be an option you’re considering. They’re fairly popular bikes in cities. If you live in a flat environment, they might be an excellent choice. There’s very little that can go wrong on a single-speed bike and they let you achieve high speeds with ease. You’ve even got the option of becoming a purist and opting for a fixed-speed, which means that you can brake just by pedaling more slowly. These take a bit of getting used to, so be careful. 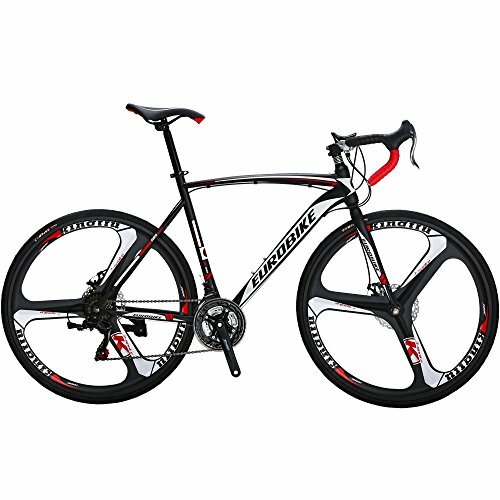 When it comes to road bikes, usually you’ll be looking at fairly thin tires. This is because, again, they minimize air resistance. If, however, you’re not a racer, adapting your tires can be a really great way of giving your bike more versatility. By choosing a bike with slightly thicker tires, you’re going to be giving yourself more stability. This means you’ll be able to ride more confidently on potholed roads or in wet conditions. Wheels should be sturdy but lightweight. Double-walled wheels will give you a good level of durability. Aero-spokes are a flashy option that will cut down on air resistance, but most riders think they’re probably style over substance unless you’re paying for carbon fiber. 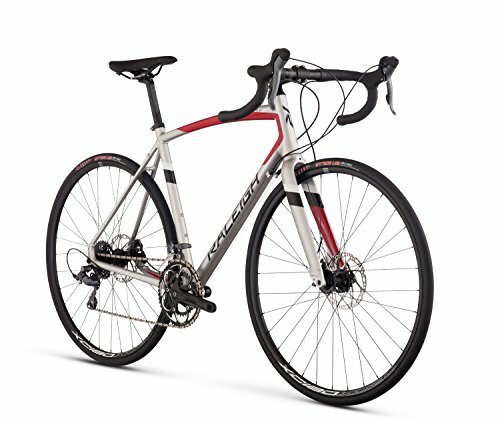 There’s a lot to choose from when it comes to road bikes. At the entry level, they benefit from ‘trickle-down’ technology where cutting-edge technology on high-end bikes eventually becomes affordable for beginners a few years later. This means you don’t have to break the bank to end up with a really decent ride. Road bikes usually mean speed which means being lightweight. If speed is what you’re looking for, consider every extra ounce carefully. Especially if you live in a hilly area, you’ll want to think about getting a lightweight frame. If you’re looking for something to get you out and about and you’re not ready for racing geometry, find something with flat handlebars that will still offer an enjoyable ride. Whatever your decision is, make sure you consider your options carefully. The more time you take, the more you’ll enjoy riding your bike and the more you’ll want to ride it! This’ll mean being fitter and healthier as well as having fun outside.